I love my weekends. I especially love Fridays and Friday evenings in particular. That kick off your shoes and unwind feeling with days of freedom stretching out before you. Routine goes out the window and while every weekend is relatively busy with kids activities etc., still I have so much more time for me. Here I am on a Saturday morning finally writing the blogpost that has had to wait a couple of weeks and I’m loving it. One of the 12 year olds is adjacent to me munching into a bowl of chocolate weetos and I can hear his enjoyment in every crunch, now he’s telling me why most famines are preventable. Next he’s opening up his gear-bag and discovering soaking football boots which are going for a spin in the dryer before his rugby match while he goes off to cook some rashers for himself and requests a poached egg from me. It’s just me and him in the kitchen and while I’m typing this I’m also tuning in to him, it’s nice to have time for one child on their own as it rarely happens. Ah, I typed too soon, his twin has joined him and is throwing more rashers on the pan and he requests a poached egg too. Their older brother is being picked up from his morning class in the city by his Dad, their eldest sister is sleeping at a friend’s after seeing Ed Sheeran in Dublin last night – the lucky girl – and the twin girls are still in the land of nod. If I were to look into the girls’ room I know I would see dishevelled hair and a foot or two sticking out from under the covers probably still wearing yesterday’s socks. 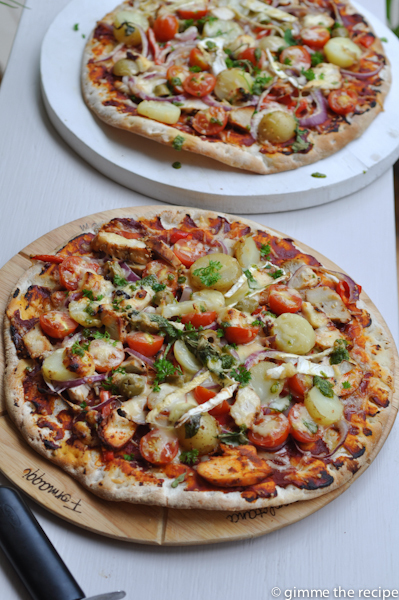 Over the past number of weekends I’ve been making these delicious and incredibly quick pizzas and doing my bit to stop food waste in the process. 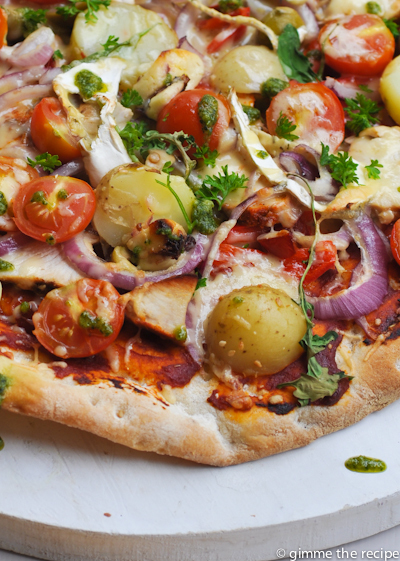 At the end of the week there’s always bits and pieces of cooked ham and chicken, salami, the odd mushroom or pepper and odds and ends of cheese hanging around the fridge that instead of hitting the bin can come together to create the most amazing pizzas. Having jars of olives, jalepenos and pesto in the fridge provides plentiful opportunity to up the flavour stakes and the heat. For these 8 minute pizzas I’ve been using pizza bases from my local Italian deli. Pane e Vino in Ballincollig. 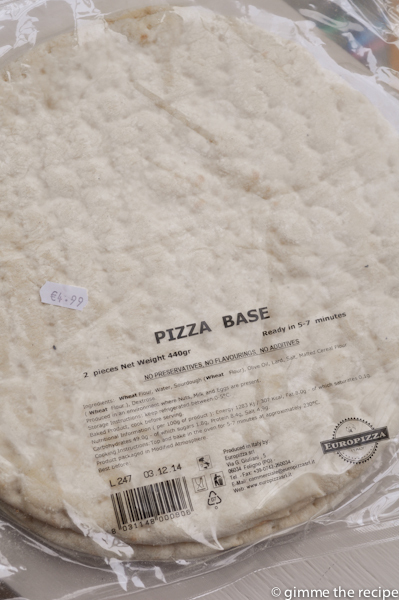 As you can see two large bases come vacuum packed together at just under 5 euro and 2 fully loaded pizzas feed the eight of us. I find the trick is to preheat the oven good and high with baking trays already in the oven so that when the loaded bases hits the hot trays they start to crisp up immediately. 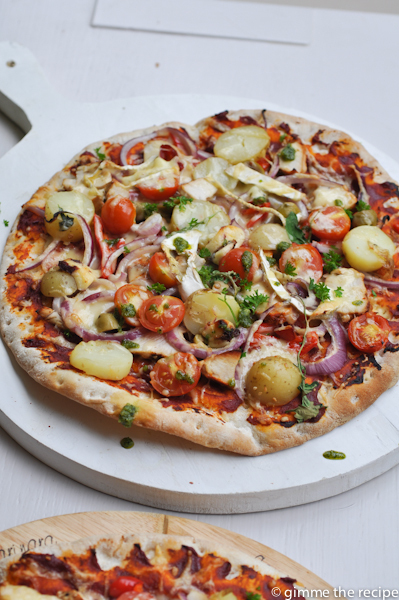 Simply smear the pizza base with a tomato puree or passata and then add your toppings finishing off with some chopped and grated cheese. When cooked serve with a scattering of torn rocket leaves or basil or parsley if you have some. Scrumptious. Despite my efforts at clearing my fridge in an edible way and being pretty good about composting vegetable peelings and apple cores etc. there has always been some food waste shamefully hitting the bin – the cooked food scrapings from the plate that the dog won’t eat, the left-over contents of the lunchboxes, the crumbs from the kitchen table. Up until now. So how does one handle all of this smelly stuff. My solution is a plastic box with a removable drawer that lives under my kitchen sink and a toughened brown paper ‘Obeo’ box that lives on top of the kitchen sink. Into the plastic drawer goes the vegetable peelings, the egg shells, the banana skins etc. and when that’s full I (or a child) takes a trip to empty it out in the composting bin that lives in the corner of the garden – it’s amazing how this breaks down and it’s satisfying to use it when planting and growing. Into the ‘Obeo’ box goes all the other stuff – the scraps of uncooked fat that you’ve cut off meat, the cooked food scrapings from the plates, the crumbs from the table, the out of date coleslaw, the ‘nobody’s going to eat that’ remnants of various food dishes like egg-fried rice, smelly takeaway etc. My ‘Obeo’ boxes are filling up in two or three days and this neat little package is then taken directly to the waste collectors ‘brown’ food waste bin for disposal – my kids tell me that this food waste is being used to make dog food, I don’t know if there’s any truth in that but I can see that what looks like tiny amounts of food very quickly add up. So who or what are ‘Obeo’ boxes and why am I promoting them? Well you can find all about Obeo the company and product here and I’m promoting them because I read about them, I ordered them, I like them and they work for me. I’ve told Obeo that I like their bags and as a growing Irish business they’d like more people to try them out and have offered a 2 months supply – if you’re interested I’m posting details on how you could win these on my facebook page (click here). 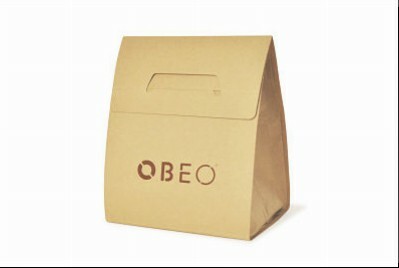 If you’re in Ireland you’re likely to see these Obeo boxes popping up in supermarkets and many other outlets. They’re a nice and simple home-grown solution to tackling Food Waste disposal in your kitchen. Very organised indeed. I really like the pizza idea. We have a food waste bin by the sink and most of it goes in there. I do get angered by having to pay an annual charge for a brown bin s well as lifting charges for what the ‘waste’ companies refer to as “high value” waste. In a nutshell, we segregate it and pay for the privilege. They remove it and sell it to energy companies. Arrrrgggg! Where did you find out that mechanical waste disposal units are prohibited. I know people already using them prior to food waste collections starting. We were planning on getting one as we already compost anything that can be composted. The remaining food collections only every fortnight I am finding repulsive. Thank you Helene, I’m glad you like my blog. Hopefully these regulations will pay off environmentally so will be worth the effort of separating the waste, it’s certainly making me more mindful of what’s in my fridge and trying to use it up & I love pizza, so that parts easy!! Thanks Sheila, haven’t heard of these but will try them as they seem to reduce the messiness!